Dave , do you have these ads in a large size? Location: So. California This is the license plate surround & Valiant matchbook ad for Bank Motors in Los Angeles where my '56 Plymouth was purchased. Location: Southern Sweden - Sturkö island I just wonder how secret the second link is Dave?! We recognise you are attempting to access this website from a country belonging to the European Economic Area (EEA) including the EU which enforces the General Data Protection Regulation (GDPR) and therefore cannot grant you access at this time. For any issues, e-mail us at mailbox@qchron.com or call us at 718-205-8000. I just wonder how secret the second link is Dave?!
" 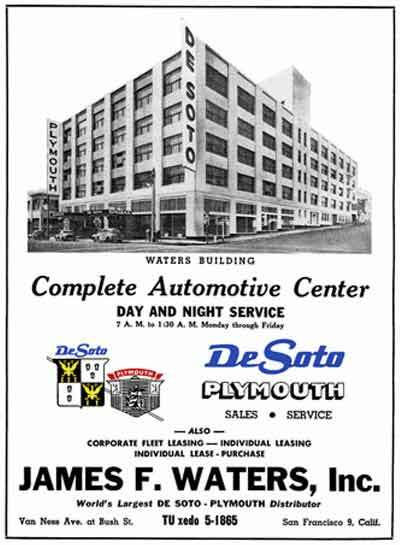 James F. Waters was an early West Coast automobile dealer in San Francisco who decided to expand his operations and enter the New York City marketplace. In 1935, he started a business in Manhattan, with seven-passenger DeSoto automobiles converted into taxicabs complete with the Chrysler Corp. warranty. The city passed regulations in 1929 dictating any vehicle used for livery or taxi cab service must be able to carry five passengers in the rear and jump seats. Only Checker, DeSoto and Packard manufactured vehicles that size to meet these requirements. On June 1, 1940, Waters leased an entire block in Long Island City at 34th Street and 47th Avenue for the DeSoto taxicab operation. All across the city, people saw the vehicles, which had a retractable roof with a molded globe that read DeSoto Sky View. In 1953, the DeSoto Retailer magazine bragged that seven out of 10 cabs in the city belonged to the company. The vehicles each had an 18-foot-long, eight-passenger body with a six-cylinder engine, manual transmission and 139.5-inch wheelbase. The end came fast, shortly after Mayor Wagner came into office and the city outlawed the widely used, long wheelbase and set a new maximum of only 120 inches. Ford and Chevrolet were now allowed to enter New York City’s lucrative marketplace. In 1955 the Waters cabs ended their reign and his Long Island City operation closed. It quickly vanished and the city soon saw Ford, Plymouth and Chevy cabs everywhere." Trunk was sealed. Some writers have said that was due to restrictions on alcohol during prohibition. The front seat had just a seat for the driver, with a platform where the front passengers would have been. The platform was for the luggage, etc. that normally would have gone in the trunk. Chrysler had finalized work on a LWB 1955 DeSoto cab - body was to be shared with the Crown Imperial, as in past years. The Engineering people even declared the first serial number for the 1955 DeSoto S22 Taxi. The 1954 DeSoto Taxi S20, 139½" wheelbase, saw production of 2,005 units. But the announcement from New York City to cancel the LWB cabs caused Chrysler and Checker to end production. Checker closed their plant for almost two years as they worked on developing a new cab on a 120" wheelbase, which was ready to go in 1956. And lasted to the end of production in 1981. Packard abandoned the LWB taxi field in 1948. GM was involved briefly in the late 1930's by taking a Chevrolet sedan and extending the body. It was sold as the General Cab. DeSoto would go back to the taxi business in January, 1957, with the introduction of the DeSoto Firesweep cab with a Dodge Coronet flathead six in the Firesweep body. With the introduction of the DeSoto Firesweep taxi, the engine serial number prefix changed from D72- to KDS6-. A total of 139 6 cylinder taxis were built for 1957. DeSoto announced the taxi based on a 6 cylinder Firesweep in 1958 and 1959, but no production numbers are known. By the way, the Queen's Chronicle is published in Glendale, New York. Location: PL / EU .